On the face of it they have little in common – she’s a woman in her fifties with early-onset Parkinson’s; he’s a teenager far from home who doesn’t fit in with the world around him. She’s trying to come to terms with her range of conscious movements being slowly eroded; his overload of feelings finds release in parkour, the art of free running. What they both want is to be able to move, but on their own terms. It is an unlikely friendship, but now their story is the subject of a film that is helping to raise awareness of Parkinson’s, the progressive neurological condition characterised by involuntary body tremors, slow movement and inflexible muscles. It is thought to affect around one in 500 people in this country and although most develop symptoms in their forties and fifties it can occur in younger people as well. There is no known cure. Sue Wylie was 50 years old in 2011 when she was told she had Parkinson’s. ‘It was a cold, brutal diagnosis that just left me high and dry, I didn’t know what to do really,’ says the actress and writer from Martinstown. Sue continued her teaching job, which is how she met Laszlo – a Swiss teenager who was in trouble for running on the school roof and was on the verge of being expelled before he could complete his GCSE exams. ‘We got talking and I suggested he write a monologue that explained his urge to go free running. He’s incredibly bright, but was completely bored by school. His only release was to jump, climb and run all over the school, which obviously didn’t go down well with the authorities and they’d had enough. As the play, Kinetics, took shape Sue approached Dorchester Arts with a view to hiring the Corn Exchange for a single performance. She met artistic director Mark Tattersall who suggested Dorchester Arts could work with Sue as a community project. 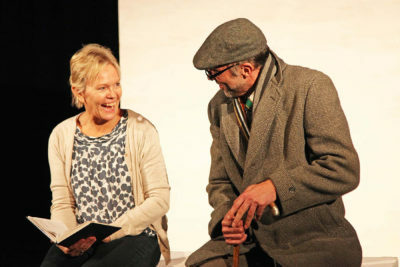 In 2016 the play – in which Sue (who played herself) and Laszlo (who left the production after four performances to be replaced by Roly Botha) are called Rose and Lukas – toured to 12 venues throughout the south and west as well as London, striking a chord with audiences regardless of how, or even if, their lives had been affected by Parkinson’s. Each performance was followed by an open Q&A session with a health professional that Poole Hospital and Dorset County Hospital consultant neurologist Dr Ralph Gregory was instrumental in arranging. By the end of the tour there was a growing realisation that something more needed to be done so that people throughout the country could see Kinetics– there needed to be a film version. Having slightly adapted the script for the screen version, Sue reprised her role, as did Roly, and in January the film screened to appreciative local audiences for the first time at the Plaza in Dorchester. Not only have Parkinson’s UK groups been organising local showings nationwide but, much to the delight of all involved, the charity and both Dorset County Hospital and Exeter University want to use sections of the film for training purposes. But the story is far from finished. Sue, whose one-woman show In Search of Stardomearned a Time Out Theatre Award nomination, continues to write. She’s on the committee for Dorchester Community Plays Association, plays tennis and enjoys yoga every week and volunteers at a school to help children with reading. ‘There could be more to come from Rose because although she represents how I felt about Parkinson’s and lots of other things in 2011, she is a character of that time and I might have slightly different perspectives now that my symptoms have progressed. I’m not sure I could play her again though. ‘I find it frustrating that the medication for Parkinson’s has barely changed for 50 years and although Neurolin smoothes things out some of the symptoms are side effects of the drug. The number of stories I hear about badly delivered diagnoses is another frustration. :: DVD copies of Kineticsare available at www.dt2productions.co.uk.